QUAD -Franciae Accurata Descriptio / Franckreich mit seinen Grentzen. QUAD, M. - Franciae Accurata Descriptio / Franckreich mit seinen Grentzen. Franciae Accurata Descriptio / Franckreich mit seinen Grentzen. - QUAD, M.
Title : Franciae Accurata Descriptio / Franckreich mit seinen Grentzen..
Map maker : QUAD, M.. Size : 7.7 x 10.6 inches. / 19.5 x 27.0 cm. 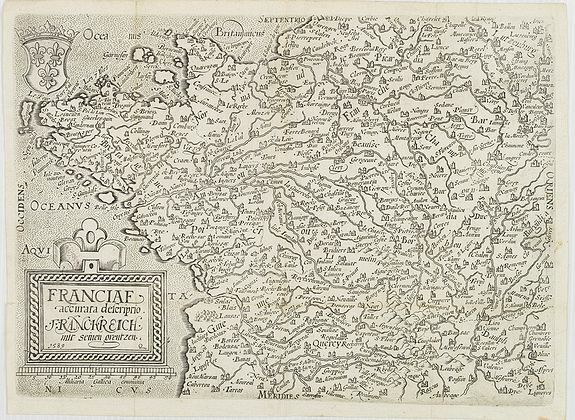 Description :Rare map of France by Quad published in "Christiani Adolphi Thudeni Historiae Nostri Temporis?" Title cartouche with date 1589 in lower left corner. Condition : Several vertical and one horizontal fold, as issued. Good impression.